Aldo Sartorio talks with an Inquirer reporter while he cuts hair at Sartorio & Sons Barber Shop, a family business, in Wilkes-Barre, Luzerne County, on Tuesday. Luzerne County was key to President Trump's victory in 2016, and Democrats are working to win back voters like Sartorio. The barber voted for Barack Obama in 2008 and Trump in 2016. WILKES-BARRE — Aldo Sartorio helped swing Pennsylvania to President Trump. Democrats now look to voters like him to turn it back their way. The 60-year-old runs a barbershop in downtown Wilkes-Barre, voted for Barack Obama in 2008, and for a time had health care through the Affordable Care Act: "I did like Obamacare." But he voted for Trump in 2016. "I was looking for change," Sartorio said as a young client asked for a cut like the one soccer star Cristiano Ronaldo wears. "Getting tired of the same ol'." His home county, Luzerne, proved pivotal in 2016. Now, as Trump visits Wilkes-Barre on Thursday night to rally his core supporters before the midterm elections, the county is poised to be a bellwether again. Sartorio isn't committed to vote for Trump in 2020. In what has become a virtual must-win county for the president and other Republicans, that could be a problem. "I just wish he wouldn't talk about himself so much," Sartorio said. "He doesn't have to tell me what a great job he's doing. Let me be the judge of that." Democrats see this fall's election for U.S. House and Senate as their first chance to make the case the president has failed to deliver on the economic promises that helped sway working-class voters. Working- and middle-class voters helped give Trump a 26,000-vote victory in Luzerne County in 2016, a swing of more than 30,000 from Obama's winning 2012 margin. Trump is returning now in support of U.S. Rep. Lou Barletta, a Senate candidate and one of his closest allies on the ballot, but also to charge up a region that could play a central role in deciding Trump's own fortunes. No Pennsylvania county moved as drastically toward Trump, who won the Keystone State by about 68,000 votes. If Trump were to lose support in Luzerne, he'd likely lose Pennsylvania – a serious blow to any reelection hopes. Said U.S. Rep. Matt Cartwright, a northeastern Pennsylvania Democrat who survived the Trump surge in 2016: "People involved in national politics ignore northeastern Pennsylvania at their peril." Republican U.S. Senate candidate Rep. Lou Barletta (R-Pa.), speaks at an America First Policies event in Philadelphia, Monday, July 23, 2018. Democrats point to Cartwright's 2016 victory — including a sizable margin in Luzerne County — as evidence that with the right message, they can still compete in such places. Luzerne was one of four Trump counties, along with Erie, Beaver, and Northampton, that Democratic Treasurer Joe Torsella also captured. "It's a county a Democrat can win, but a Democrat has to more clearly articulate solutions to the concerns that blue-collar workers are feeling," said J.J. Balaban, a Democratic strategist based in Philadelphia. Polling by both parties shows the populous suburbs around Philadelphia and Pittsburgh are increasingly hostile toward Trump, making Luzerne and similar areas more vital to Republicans, including Barletta and gubernatorial nominee Scott Wagner. Democrats are relying on a suburban surge — and say they don't necessarily need to win Luzerne. Just cutting into Trump's advantage there might be enough to reclaim the state. Democrats hope to erode that by attacking a record they say contradicts his populist rhetoric. They argue that after Trump's promises to shake the system, his economic policies have mostly followed a traditional Republican playbook: tax cuts tilted toward the rich, proposed cuts to Medicare, and health-care rollbacks that hurt everyday people. U.S. Sen. Bob Casey takes the stage at a campaign event in July. Paul Kanjorski, a Democrat and Luzerne County native who represented the area in Congress for 25 years, pointed to reports the administration was considering a capital-gains tax cut worth $100 billion, a shift that would almost entirely benefit the wealthiest taxpayers. "I don't want to use the word con, but he made a Barnum-Bailey type approach and won the people," said Kanjorski, who defeated Barletta twice before losing to him in 2010. "They came out out of annoyance and disgust, they voted, and I think they are now able to see the ramifications of their votes." Barletta's opponent, Sen. Bob Casey, has emphasized his opposition to Trump's tax cuts as he seeks reelection; fellow Democrat Conor Lamb attacked the plan as lopsided and wasteful when he won a March special election in a Western Pennsylvania congressional district that Trump won by a landslide. Still, voter surveys show Trump retains strong support in northeast Pennsylvania and many of the working-class areas that backed him. Some endorse him even more strongly as the criticism against him rises — a sentiment likely to be on display Thursday night. "The economy's up, I think that's the bottom line," said Mark Greenwald, 48, who installs alarm systems and other security equipment. Trump supporters Tony Schirillo, left, and Mark Greenwald, right, speak with a reporter at Dukey’s Cafe in Wilkes Barre, Luzerne County. Sitting at Dukey's Cafe, a Wilkes-Barre bar where you can still smoke, Greenwald said he has seen a slight uptick in his take-home pay: enough for a week's worth of gas. He said the government cares more about "illegals" than American citizens and credited Trump for trying to bring back jobs that went overseas. In more than a dozen interviews with people in Wilkes-Barre on Tuesday, many said they were thankful for Trump's tax cuts, despite Democratic complaints that the greatest benefits went to the wealthy. "For people who live where I live, they haven't had a raise in a long time," said Sue Henry, a former conservative radio host in Wilkes-Barre. Said Barletta, a former mayor of Hazleton in Luzerne County, "Many of the forgotten men and women that the president talked about, many who were Democrats, blue-collar Democrats and independents, will go the polls again because they want to see this president's agenda supported." Whatever Democrats' hopes, Barletta predicted a raucous show of Trump support Thursday. Sue Henry, a former radio host in Wilkes-Barre who is now running for state representative, says support for Trump has endured in Luzerne County. Trump has also continued to stress the kind of divisive cultural issues that fire up his mostly white base, attacking black NFL players who protest police brutality during the national anthem, strongly opposing illegal immigration, and supporting cutting legal immigration. These issues offer an emotional connection with Trump, especially in an area with many veterans, said Thomas Baldino, a political science professor at Wilkes University in Wilkes-Barre. They also have an economic component: Complaints about immigration laws resonate with people who fear their livelihoods are being taken away by immigrants, Baldino said. 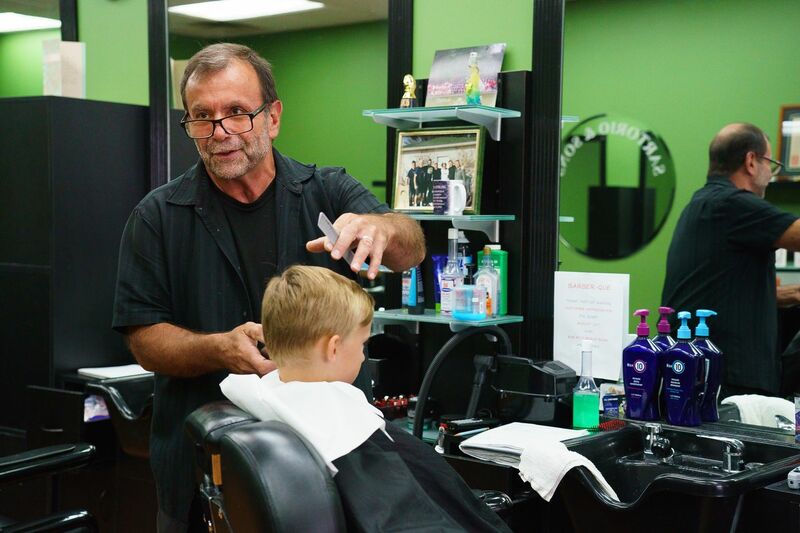 Sartorio, the barber, "didn't like" the scenes of immigrant children separated from their parents, "but at the same time, my parents came over here legally. That's the way it should be done." Luzerne, like much of the Rust Belt, was a Democratic bastion that has moved toward Republicans as its economic fortunes dimmed. First the coal mines closed, putting many men out of work. Many of their wives worked at local textile factories, but those moved to Southern states with cheaper labor — and now families had lost both jobs, Kanjorski said. People lost faith in politicians, their employers, unions, and were looking for a seismic change, he said. The median household income in the county is $46,580, more than $8,000 below the state average, according to 2016 census figures; 22 percent of residents have a bachelor's degree or higher, compared with 29 percent statewide. Though the county is still 82 percent white, it has also seen an influx of Hispanic immigrants, which some longtime residents resent. The search for something outside the old political system wasn't limited to Republicans. Bernie Sanders won nearly 47 percent of the Democratic primary vote in Luzerne. Shafeeq Muhammad, a retired union steamfitter, voted for the Vermont senator and still thinks he represents Democrats' best chance at the presidency. Sanders was "trying to get fairness in government," said Muhammad, who immigrated to the U.S. decades ago from Trinidad and Tobago. "People at the bottom, we the people, we're not getting represented." While his neighbors praise the president, Muhammad blamed Trump for a rise in "blatant racism." He recalled walking into Wal-Mart with his wife two weeks ago when a white woman driving by yelled, "Get off the road, n—–!" Democrats argue that Hillary Clinton, with her expensive private speeches and years in elite circles, was a uniquely flawed candidate for this region, and that Casey will have a far better chance. While Casey has tried to appeal to a reenergized Democratic base by opposing Trump at nearly every turn, he is also a native of Scranton, in neighboring Lackawanna County, and he and his father, former Gov. Bob Casey, have made the name a trusted brand in northeast Pennsylvania. When Trump rallies with Barletta on Thursday, they'll do it at the Mohegan Sun Arena at Casey Plaza — named for the senator's father, who secured funding for the site. Even if Casey does well here, the overarching question is whether any of the Democrats eyeing a 2020 campaign can do the same. In interview after interview, area Democrats said that if Joe Biden had been on the ballot in 2016, they would have won the county and the state. Another son of Scranton, Biden could run in 2020. But many are hoping to see a new generation of leadership, one that reflects the party's ethnic diversity and embraces a more aggressively liberal agenda. Some party leaders and activists want a stronger emphasis on fighting climate change, and a number of rising voices have called for abolishing Immigration and Customs Enforcement, the kind of issues that enthuse liberal voters but may play to Trump's strengths in Luzerne and elsewhere. "You know we talk about the environment changing, climate change," said State Rep. Eddie Day Pashinski, a Democrat whose Wilkes-Barre office includes news clippings about the unveiling of a postal stamp of a coal miner. "Well, that's OK, when your job is safe and your retirement is safe and your health care is safe." Correction: A previous version of this article incorrectly characterized President Barack Obama's margin of victory in Luzerne County in 2012.